The concept of harmony between man and nature was the foundation, on which the palace at the coastal town of Balchik was built, while the Baha'i cult to beauty breathed life into it. Turning into reality the dreams of an eccentric Romanian queen - Marie of Edinburgh. The construction of the palace, later to be called "The Quiet Nest", began in 1924, when the region of Southern Dobrudzha was still in the hands of Romania. Armies of experts from Italy, Switzerland, Bulgaria and Romania were gathered together to draw on their skills in architecture, gardening, stone-cutting and painting and turn the unique steep slope of stones over the Balchik Gulf into an extraordinary piece of architectural art and a refreshing oasis amidst the dryness of Dobrudzha plateau. It is a small surprise that Queen Marie of Romania picked this wild and picturesque spot over the Balchik Gulf to live and dream away. It was its virginity and romanticism that captured her heart and imagination, while roaming through Romania's newly conquered areas. The Baha'i teaching, whose fervent follower the queen was, preached that all religions can be united for the sake of beauty. The palace, together with downtown Sofia, is one of the few places in the world where Christianity and Muslimism live peacefully together and complement each other. 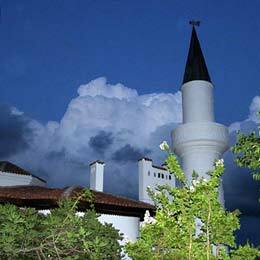 Here the visitor can see the white minaret of a mosque, sporting a weathercock on its edged top, right next to the dome of a Christian church. The silver well, with a ceramic medallion with the Virgin Mary and the infant Jesus chiseled out, is one of the most inspiring and touching Christian symbols here. If you see your reflection in its clear waters and drop a coin, be sure all your dreams will come true! The queen's castle is located on the very coastline, bringing together elements of Mediterranean culture, Bulgaria's Revival and Oriental exoticness. The "Quiet Nest" villa is bordered by the queen's home at the one end and the chapel at the other. In between is a labyrinth of gardens, flowers, lakes, bridges and paths, linking into one organic whole the separate parts of the complex - an irrefutable proof of the owner's delicate flair for harmony and aesthetics and her never-ending search for beauty. Queen Marie (1875-1938) was the daughter of the Duke of Edinburgh, second son of Queen Victoria, uncle of George V, and of Grand Duchess Marie, daughter of Tsar Alexander III of Russia. She was, therefore, first cousin to King George, by birth a Saxe-Coburg and Gotha, by marriage a Hohenzollern, having married into the Catholic branch of that family when she became the bride of Crown Prince Ferdinand of Rumania. The palace and the pictures hanging on its walls paint the picture of a romantic and eccentric woman, whose vision transcended the everyday and the historical and poured over the invisible and the occult in a bid to explain the ups and down of life and destiny. After her death and in accordance with her will, her heart was brought to the palace, cushioned in a gold casket, to spend two years at the cloister of her house of dreams. A day after Bulgaria restored its reign over Southern Dobrudzha in accordance with the Treaty of Craiova, the casket was taken back to Romania. The turn of events, however, gave birth to a new beginning - the botanical garden, which sprawls on the territory of the queen's former summer residency. It's not for nothing that the garden, one of Bulgaria's four botanical gardens, was named after her house, "The Palace", even though its design and selection of flowers was completely overhauled. Bathing in sunlight most of the year, the garden is home to more than 2000 plant species belonging to 85 families and 200 genera. One of the garden's main attractions is the collection of large-sized cactus species arranged outdoors on 1000 mВІ, the second of its kind in Europe after the one in Monaco. Unfortunately a few years ago the garden's future was threatened by wrangles over ownership and revenues collection. It would be unforgivable if we fail to protect the heavenly and exotic beauty of this unique part of Bulgaria's Black Sea coast. Standing right by one the world's best symbols of differences overcome, unity and beauty.